The Ghost of Goodwill Soon to be Wandering Illegal Pete’s? In learning that Illegal Pete’s will soon be moving to Old Town, Fort Collins, I thought it would be interesting to explore the history of the building that the restaurant will be moving into. As usual, I found more than I expected, including a snippet of history that appears to have been twisted a bit over the years. But I’ll lay out the evidence and do my best to set things straight. So let’s start at the beginning. Daisy Welch Bosworth, Della Miller, Lilly Clay, and Clark Moore standing in front of the Howe house a few years after the brutal murder. On April 4, 1888, James Henry Howe murdered his wife of at least 15 years right in front of their house on Walnut street. (Howe was later taken into custody, and that evening an angry mob pulled him from his jail cell and lynched him in front of the court house on West Oak street.) Now if you ever go on one of the ghost tours that are given downtown, you might be taken past the Armadillo restaurant [now the Elizabeth Hotel], where you’ll be told the story of James and Eva. It’s on that spot, they’ll tell you, that James carried out his horrible atrocity. In addition to tales of ghosts seen traversing through the restaurant, there is also the fact that the Howe house was moved to West Myrtle Street and, according to a note on the Fort Collins Archive website, the move took place in 1947, the same year that Oakes Motor Company moved into the lot where the Armadillo is today. 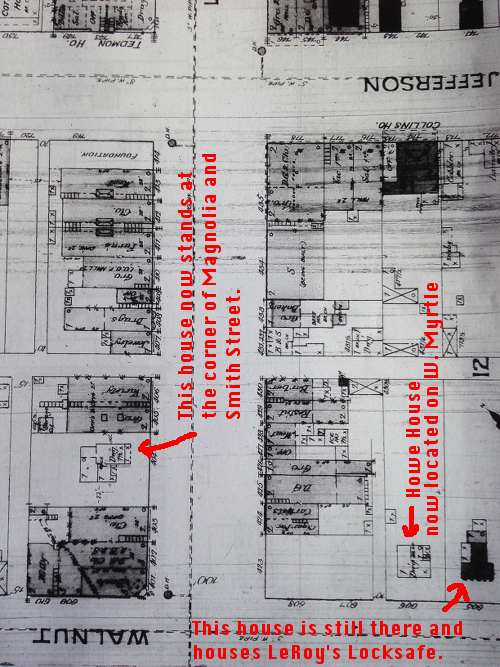 However, there is even older evidence that shows the Howe house stood closer to Linden street. According to the newspaper that was published the day after the double tragedy took place in 1888, the Howe’s lived “less than half a block away” from Linden. And witnesses testified that despite strong winds, they could hear Eva’s cries of “murder!” from Linden. So the Howe house stood not at the end of Walnut, where the empty Armadillo restaurant building stands today and where some tour guides might tell you the murder took place, but right where the vacant Goodwill building [now Illegal Pete’s and Prost Brewing] now stands. Now I must admit that when it comes to ghosts, I’m not an amateur, let alone an expert. But it seems to me that if Eva’s ghost is going to go a hauntin’, doesn’t it make sense that it would be where she died, not where her house was later moved to? Or, if she stayed with the house rather than the plot of ground, then wouldn’t good old Eva have moved on to Myrtle street, where her house now stands? The thought that she is still hanging out at the Armadillo building seems a bit hard to believe, even for a ghost story. Perhaps some day customers will spot a spectral form hovering over their tacos and burritos at Illegal Pete’s. But I find it unlikely that, if the Bohemian Foundation tears down the Armadillo and replaces it with a hotel, an apparition will be spotted in the dining room, hovering around the chandeliers (a la Ghostbusters). Wherever the house originally stood, county assessor’s records make it clear that in 1910, a one-story long brick building was constructed at 320 Walnut. The building appears to have had a dirt floor in the beginning, although a basement must have been added at some point because it was refurbished in 1964. And in 1948, the front of the building was “modernized,” which must have been when the light brick replaced the original red that can be seen on the sides and back. The building housed several automotive shops including the, Marsh Motor Sales Co., Robinson Garage, Motor Service Co (under F. C. Maxwell), Motor Service Co (under T. H. Baxter), Auto Service Co (under W. R. Hiigel), and apparently last of all, the Montgomery Ward Auto Shop. Goodwill took over the building in the 1960s and was a mainstay in Old Town for over 40 years. 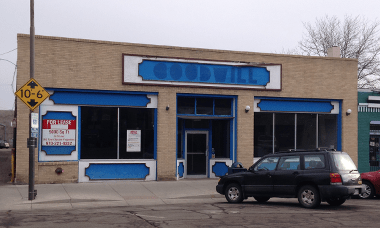 However, with a new store on the south end of town and difficulty in bringing in inventory to the Old Town store, the north side Goodwill shut its doors and sold the building in April of 2009. Illegal Pete’s, a local mini-chain that started in Boulder in 1995 and that sells Mexican food in a San Francisco Mission District style, recently purchased the building and drew up plans for some renovation and improvements to the property. Because 320 Walnut is within both the local and national Old Town historic districts, all exterior renovations have to get a thumbs up from the Landmark Preservation Commission. So on February 12, 2014, Tim Politis from One Line Studio, and Peter Turner, the owner of the building and founder of Illegal Pete’s, brought their preliminary building ideas to be reviewed by the LPC. Preliminary concept drawing of what Illegal Pete’s may look like once the building is renovated. According to the Fort Collins Municipal Code for Landmark Preservation, the LPC needs to take into account 5 things (and I paraphrase): 1) How does this affect the historical or architectural character of the property? 2) How would these changes affect the overall district? 3) How different is this all going to look when all is said and done? 4) Does this help to protect, enhance, and perpetuate the use of this landmarked property or district? and 5) How much do the proposed changes meet the U. S. Secretary of the Interior standards for preservation, reconstruction, restoration, and/or rehabilitation? So what it all boils down to in this instance is, “If F. C. Maxwell or T. H. Baxter or any of the mechanics or Goodwill folk who have worked in this building over the past century were to walk down Walnut street, would they immediately recognize this building as their old work place? Or would they have to stand there scratching their heads and puzzling it out for awhile? If the former is true, then Hallelujah! pass the grout and let’s get to work. Another rendering of the proposed Illegal Pete’s building with addition of a second story set back far enough that it will be hard to see from the street. Illegal Pete’s is hoping to open in Fort Collins some time this summer. After looking over the Sanborn maps from 1886, it is even more clear that the Howe house was, indeed, located where Illegal Pete’s is today. This is from the 1886 Sanborn map. The Sanborn maps were used by the fire department so they would know how many buildings were on each property, where on the property they were located, and what he best access would be to put out a fire. I dug up far more information on James and Eva Howe, and their house, than I could possibly fit into this article. So I quickly dropped a lot of that additional information into a secondary post which I’ve published on my personal website, North of Prospect. 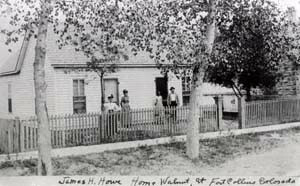 If you’re intrigued by the Howe story and want to hear more, click through to the post, “Eva and James Howe… and their house.”Stay tuned until next Monday when we’ll take a look at the West Central Neighborhoods – which are also the subject of city talks that will be taking place this and next week. To find out when there will be a meeting near you, check out this West Central Area Meetings press release. Residents of the West Central neighborhoods are particularly welcomed to the meetings, however anyone with concerns about traffic patterns through those areas might also wanted to drop in to one of these meetings. The West Central Neighborhoods include (roughly) the neighborhoods bounded by Mulberry to the north, Taft to the west, Mason to the east, and Drake to the south with the CSU campus excepted. 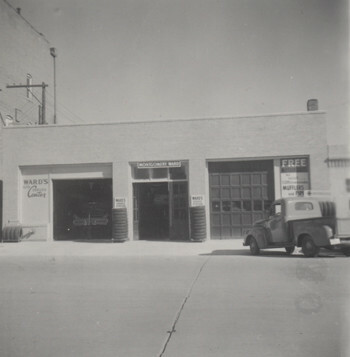 The photos of the Howe house and the Montgomery Ward Auto Shop are from the Fort Collins History collection through the Fort Collins Museum of Discovery Archive. 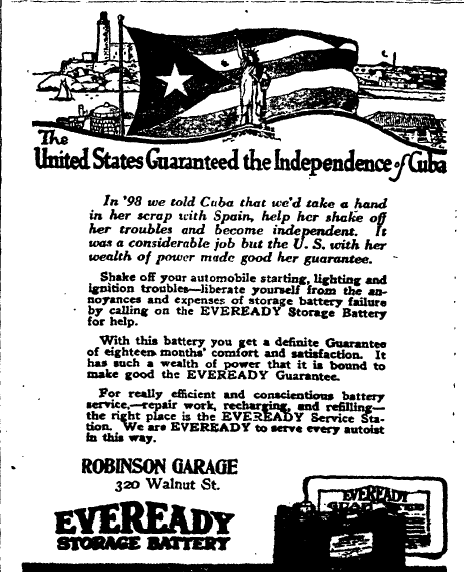 The Eveready Battery Ad for Robinson Garage is from the Fort Collins Courier, August 8, 1919. 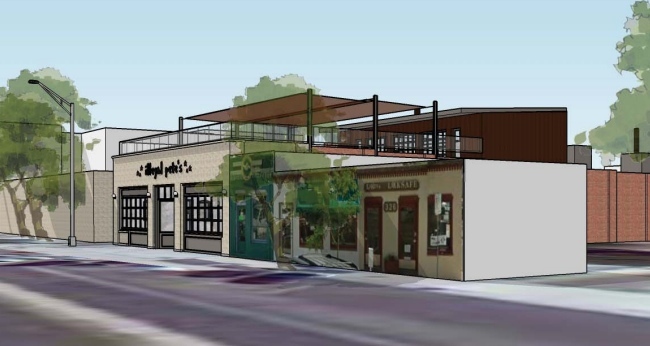 Images of the proposed Illegal Pete’s building are from the February 12, 2014 Fort Collins Landmark Preservation Commission agenda notes (pdf). Quotes from the LPC member mentioned in the article are from the minutes of the February 12th LPC meeting as presented in the March 12, 2014 meeting notes (pdf). – “Eva and James Howe… and their house.” North of Prospect. March 24, 2014. The Fort Collins Municipal Code for Landmark Preservation can be found at http://colocode.com/ftcollins/municipal/chapter14.htm. Feel free to groan over my paraphrasing of the document. The code writers had a lawyer to help them get it just right. I have written my paraphrasing with brevity, base understanding, and a dash of snark as my writing companions. Wow, What an incredible article. As marketing director of Illegal Pete’s, this got me even more excited to be bringing Illegal Pete’s to Fort Collins. Thanks for taking the time to research this. We would otherwise have had no idea. Glad you enjoyed it, Virgil! Best of luck with the new location. The Old Town district is an important one and it looks like you will be improving it. The 1948 update of the building didn’t leave them much to work with, but at least it will get used in a positive way and increasing the intensity of the allowed zoning. Good work and good article. The first Jewish family in Fort Collins lived on the same block in the house that is now 326 Walnut. I wondered when I saw the name Reingold if they might be Jewish. Do you know anything about the family? It looks like their house is still there, integrated into Halley’s Comics and Leroy’s Locksafe. The website for Leroys LockSafe has some info on the family who lived in the house and Wayne there has more background. Wayne is my brother and our mom owns the rest of the buildings to the SE of the old Goodwill. Oh! Perhaps I’ll drop by Leroys and talk to Wayne. And I’ll definitely be checking out the website. Thanks so much for the tip! interesting article and interesting places, I enjoy your sharing. Yes, I’d love to see a copy. As I wrote in another reply, since posting this I’ve learned a little more about Eva’s ghost and I’m hoping to do another writeup about the story… probably around Halloween time.